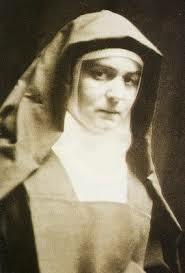 These last recorded words of Saint Teresa Benedicta on 6 August 1942. One of Edith Stein’s former students recognized her at the train station in Schifferstadt, as she stood at the window of a locked compartment. “Ad orientem. Yes, the last phase of her sacrificial ascent, toward the light, had begun. We do not know when, where, and how she reached her destination. Many rumors, including that of her murder by gas in Auschwitz, have reached us, but not one confirmed reliable report. “We no longer seek her in this world, but with God, who has accepted her sacrifice and who gives its fruit to the people for whom he prayed, suffered, and died, in the fullest sense of the word.